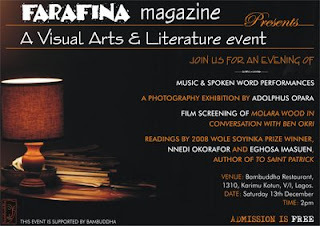 Farafina Magazine invites you to join us for our premiere Visual Arts & Literature event holding at Bambuddha Restaurant on the 13th of December, 2008 at 2 pm. There will be a photography exhibition by Adolphus Opara, a film screening (selected clips from Molara Wood's interview with acclaimed writer, Ben Okri), spoken word performances, and readings by Nnedi Okorafor and Eghosa Imasuen. Some new information... Timi Dakolo, winner of the inaugural Idols West Africa, will also be at the event.He will be performing.